Review: I rarely review picture books or texts that weren’t published recently. 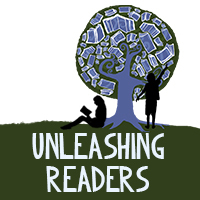 For me, the blog is a place for me to highlight newer books (whenever possible). I love picture books, but Kellee often reviews them, and I love young adult literature, so those are often the titles I review. After I read this book, I couldn’t wait to blog about it because it is easily one of the best picture books I have ever read and is worthy of the praise it receives. Set in the 1960s South, this moving, lyrical text depicts the Civil Rights Movement through the eyes of a child who just wants to adventure with his friend. The messages are powerful, and I plan to purchase it to read again and again with my son. After we read this as a family, my husband and I wondered if it was a work of nonfiction because it felt so very real to us. 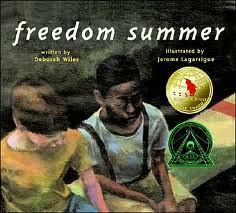 You can view Kellee’s review of Freedom Summer here. Teachers’ Tools for Navigation: The most obvious choice would be to use this text to teach about diversity, discrimination or the Civil Rights Movement. I would also love to pair this with The Other Side by Jacqueline Woodson. Students would find great value in comparing and contrasting the imagery and messages of these two texts. I could also see it being paired with texts like To Kill a Mockingbird by Harper Lee. More than anything, this is a book about the power of friendship. Discussion Questions: How do these boys view their world differently from the adults around them? ; Why might the author have chosen to end the text the way she does? What message does it send? ; How do the illustrations support the readers’ understanding of the text? John Henry says I smell like a just-washed sock. I just found this in our school library. I was looking for more books by Wiles & there it was. It is a good book, would be a good introduction to this time for those younger students who are too young for Revolution. Fun that you reviewed it today! Love your review! Thanks for sharing with #diversekidlit! This does indeed sound a wonderful book – i love the extract you give. And it’s interesting what you say about reviewing newer vs older books. I find that often the durability of good multicultural books means that it’s worth drawing attention to them down the line as well as when they are first published – and thank you for doing that here, because I didn’t know about this book and I will definitely look out for it.